When it comes to watches, I am generally able to figure out how to read the time on the watch, as well as grasping at least the basics of how it is things are being indicated on the dial. With a simple three-hander, there’s not much to decipher, as it’s rather familiar. You can get into some esoteric designs and displays though, and then it gets a bit trickier. I will admit, when I first saw the images of the Drawing 17 from Projects Watches, I finally had to ask the brand to enlighten me as to how it was working. You see, the Drawing 17 watch pulls inspiration from Drawing 17 by Wassily Kandinsky, so you end up with a very stylized handset. At first glance, it appears that only one hand is attached to the central arbor, and the other two are attached from that. Which makes for some confusing mechanics. As it turns out, there was a very simple solution here. While the seconds hand is indeed mounted onto the arbor, the design elements that represent the hour and minutes are actually printed onto two clear discs, which are turned by the Miyota 2036 movement. This is a clever way to implement things, and allows for a very kinetic expression of the art. For reading the time, you rely on the triple slashes to read the hour, the long, slender single line for the minutes, and then the short, wide hand to indicate the seconds. 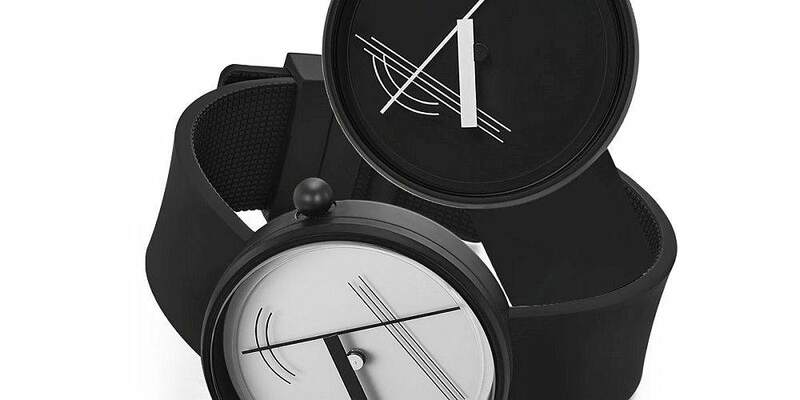 This, as the brand points out, keeps with the idea of only the wearer being able to easily read the time. I will say, most of the prior outings from Projects Watches have been quick to decipher, but the Drawing 17 is perhaps starting to verge on more of an analog interpretation of what the crew over at TokyoFlash go for – namely, crazy ways to tell you the time. Unique and stylish. Well done! Even the crown is in the Kandinsky style.